The closing arguments may start as early as today and, if their published schedule is to be believed, CNN will be streaming it. So it looks like they've reversed their earlier decision not to cover closing arguments. 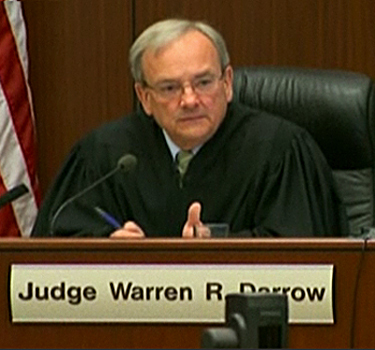 Judge Darrow also consented to a second camera last Friday. I note in the minute entry his ruling was cc'd to counsel for KPNX Broadcasting, Tru TV, and In Session, and counsel for KTVK-TV. I'm guessing that the Phoenix channel KTVK is the new to the party? So we've gone from next to nothing to pretty decent media coverage. Meanwhile, a lot of the fine points of the closing arguments and the jury instruction still seem to be in dispute. They were not resolved as of yesterday and trial watchers have been missing some brisk arguments. Court documents provide some insight into the minutia. The defense has proposed some rather lengthy jury instructions and followed with an amendment. They have also requested that Judge Darrow restrict prosecutors from creating reversible error, which is kind of nice actually. They've outlined their thinking on grounds for appeal and told the State what landmines to avoid. Handy. As I said before, the defense has been arguing that the State has been withholding evidence by not anticipating the defense's theory two years ago and saving and testing any and everything conceivable... and inconceivable, even. This contention graduated from the bloviating rhetoric stage to a request from the defense for a Willits instruction, which they reference in their proposed jury instructions. (I don't find a specific motion on the server.) The State wrote a response to that request. It makes for good reading. It also clarifies fully they did not destroy or make unavailable any of the evidence obtained; quite the contrary. It also goes a long way to debunking the defense's poisoning theory. Based on the findings of the medical examiners, the State had no reason to believe the victims' blood needed to be tested for any toxins. Nor, apparently, did the doctors who treated the victims and the other participants who suffered injuries from Defendant's extreme heat event. While it is true that toxins were initially suspected when medical providers became aware of the mass casualty event, according to the participants medical records not a single participant was ever tested for any toxin other than carbon monoxide. 1 which was quickly eliminated as a possibility. Even the statement heard the evening in the dining hall was very tentative as to the cause of the injuries: "We're not exactly sure why, could have some carbon monoxide with maybe some organo-phosphates maybe that were mixed in somehow." These are points that cannot be emphasized enough, in my opinion. The background noise that the defense has endlessly repeated before the jury was speculative and demonstrably proved half wrong. The more important point, because of its subtlety, is that other poisons like organophosphates were, effectively, ruled out by toxicology because none of that was in the differential diagnosis and therefore tested. Only CO was tested and then ruled out. And, as I was reminded of the other day, Dr. Cutshall specifically said there was more evidence of anti-cholinergics than cholinergics. Organophosphates were not ruled out by lab testing because they were ruled out by the clinical data. So the haggling is expected to continue today and I don't know, as of now, if CNN will be streaming any of the legal arguments. They seem to be holding out for the closing arguments. Also unclear is whether or not the State will call rebuttal witnesses. As per April Santiago, it wasn't discussed yesterday, so it would seem not. And if they do, who knows if that testimony will be covered. As per Mark Duncan, the issue of whether or not the lesser included charge of criminally negligent homicide will be up for consideration by the jury appears to be settled. The jury's option to consider returning a verdict on the lesser-included charge of negligent homicide will also be a part of the instructions, and Darrow allowed he would consider Hughes' motive argument in that light. This is kind of a big deal. A number of people have said that while they don't think this rises to reckless manslaughter, that lesser charge of negligence is well within reason. This includes much of the In Session panel who opined endlessly that prosecutors had just ridiculously overshot by charging manslaughter, but that much of the evidence presented sounded like criminally negligent homicide. More insight into last week's proceedings are available on Connie Joy's Facebook page. Joy was present in the courtroom and got to see what we who are so ill-served by CNN could not. It's an open page and I recommend looking at some of her lengthy, detailed comments. As per Joy, Luis Li was in rare form during his argument for the directed verdict. The other standout from Li's run over time speech, was his discussion of their beloved waivers. He read from a waiver that BULL RIDERS HAVE TO SIGN IN A RODEO and said that it should be treated the same way here. All adults makeing the informed decision to do something dangerous. Yes, I can hear some of you swearing now. In Li's mind people signing up for SPIRITUAL Warrior looking to have a postive spiritual experience in the desert is the same thing as PROFESSIONAL Bull Riders in a rodeo who know EXACTLY what they are signing up to do. As I've said repeatedly, the waiver was weak. If they'd provided waivers along the lines of Outward Bound with a thorough health questionnaire -- and before the sale was final -- they might have a leg to stand on. Then people would have been clearly informed of the risk and actually been able to opt out. Bull riders... Jeebus! Anyway, Sheila Polk argued the very important that the waiver actually shows that Ray had considered the possibility of death, which is a very important point. That waiver cuts both ways and is actually a better tool for the prosecution than the defense. I also learned from Joy's write-up that it was Truc Do who was responsible for the absurdly large chart that upstaged their star witness Dr. Ian Paul. Apparently, Kinko's misunderstood her instructions. Having listened to her talk, I'm not surprised. (I still hear the grating sound of her voice and cringe-worthy mispronunciations in my sleep, btw. I'm half convinced she'll be in my nightmares for years to come.) I could also see her making the cardinal error of talking down to some poor minimum wage worker at Kinkos. Never a good idea to be condescending to people who do your grunt work. Man can they screw you. We all chuckled when we saw the GIANT posterboard that the defense had made up with a summary of the medical info on those injured. Do made the comment that she had ordered it from Kinko's but that they must have misunderstood her instructions. Again, bigger is not always better, and more lawyers is not always better than one good one. Overkill seems to be their theme, amazing since JAR still clings to the notion that he is broke. Anyway, I think they could have minimized the damage of that colossal prop failure. What they really needed was a tiny model of Stonehenge and some dancing dwarfs. That would have been an ideal distraction, I think. And it might have kept the jury's interest, which according to Joy, Dr. Paul did not. During Dr. Paul's direct by Ms Do one thing did stirke me and others in the court room. The jurors looked board with his testimony. Most were not taking notes. Is this a sign that they have already made up their minds? Joy also observed some shifts in Ray's demeanor, though not any hint of awareness of his own culpability. What I did observe in the courtroom this past week compared to the first day of the trial was a man trying to maintain his outward show of superiority and smugness, but not doing quite as good of a job at it. Let me say this first so there is NO misunderstanding. I do NOT think that for one moment it has gotten through to him what he did and the devestating wake that he leaves behind him. I say leaves because he is still doing it. Telling witnesses that it was there fault that their friends died to see if they could be rattled on the stand is just plain crule. That WhooHoo tweet that he might get off at the Brady violation shows he still does not get that this trial is not all about just him. My husband made an observation last night about the incredible audacity of this man as a leader of a seminar called Spiritual WARRIOR. If a military officer had abandoned his injured and dying troops like that -- going off to grab sandwich and a shower -- he would be in Leavenworth turning big rocks into small rocks. Lets hope civilian justice is as thorough.